Medically warranted grooming and therapeutic bathing services are available. No specialty cuts are done;we recommend a groomer for those needs. We can provide advice regarding the correction of problems such as excessive barking, chewing, spraying, scratching, digging, house soiling and aggression. Great information is also available through The Dumb Friends League. Choose from the services they offer and select behavior help, look for the handouts. We provide cat and small dog boarding as a service to our clients. All boarders receive personal attention from our caring staff. Pets may be dropped off and picked up during regular business hours Monday through Friday. Sorry, no weekend hours. Chiropractic manipulations to assist any pet for more comfortable living, recovery from injury and especially agility training. Our dental services include teeth cleaning and polishing, charting, X-rays, tooth extractions and minor oral surgery. Some staff has received additional training from the University of Ohio Dental Seminar. Our hospital is equipped to provide endoscopic procedures, radiographs, ultrasound, diagnostic and therapeutic services to care for your pets' complete health care needs. We will provide guidance regarding your pet's nutritional needs for each life stage, including dietary requirements for growth, weight maintenance and performance. A proper diet is the basis of any good health plan for healthy living and your pet is no different! Please call our main telephone number for instructions for after-hour emergencies. Currently weekend emergencies are referred to the All Pet Emergency Clinic downtown at (812) 422-3300. As part of our commitment to educate our clients, we individualize each pets needs when recommending a vaccination plan. We do NOT believe in "one size fits all" vaccine protocols. We develop programs for the specific needs of your pet based on lifestyle, exposure and risk. Vaccination titers can also be done to determine a pet's level of defense against certain diseases. Providing Acupuncture, Food Therapy, Herbal medicines, and Tui-Nai. Click on these alternative therapies to learn more. Therapeutic laser is becoming popular in human as well as veterinary medicine. It allows for penetration of deep tissues and promotes blood flow, pain relief and expedited healing. An excellent adjunct to rehabilitation therapy or helping pets to lose weight. 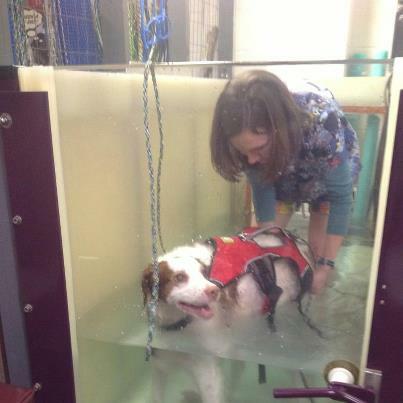 The underwater treadmill provides resistance training to improve muscle mass. It takes excessive pressure off of joints to make exercising easier in overweight patients. In pets recovering from neurological disease or surgery, it can be used to "re-teach" muscles and nerves how to properly function.